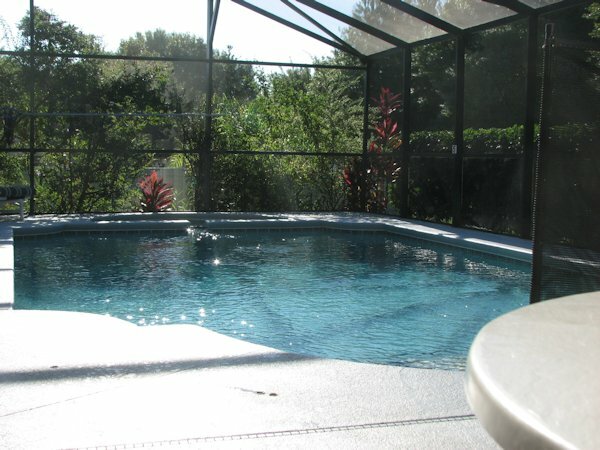 Welcome to Dream Stay Orlando Villa 2200 sq ft of living your dream vacation. 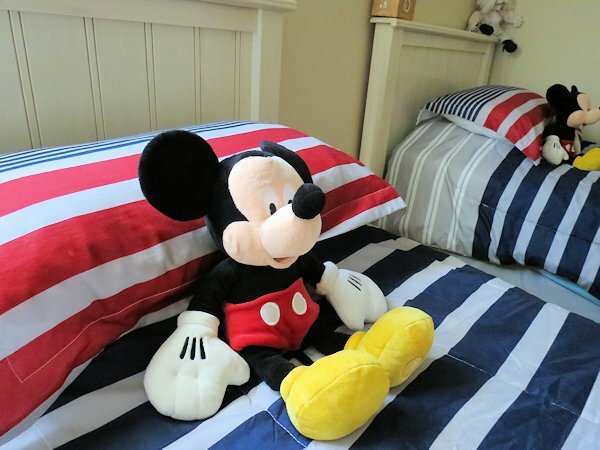 Our Orlando vacation rental home is just 10 minutes from Disney's main gate, yet maintains an air of peace and tranquility the perfect place to unwind after a fun filled day at the parks. If you are looking for somewhere to spend your vacation that is spacious, luxurious and breathtaking then look no further. 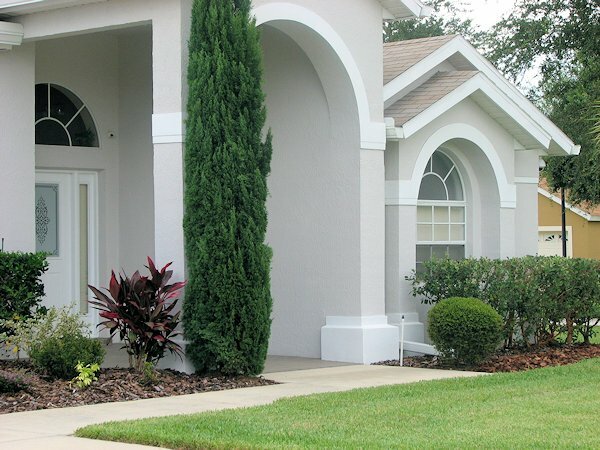 Our vacation home is maintained to the highest standards and we are just a phone call away should you require any assistance. 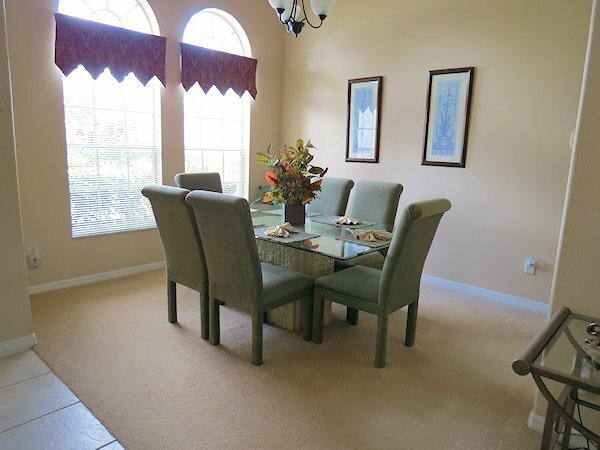 Our Orlando vacation Villa is a luxury 4 bedroom vacation rental home (which is one of the largest 4 bedroom homes available), is fully air-conditioned with ceiling fans throughout for those very hot Florida days and nights. 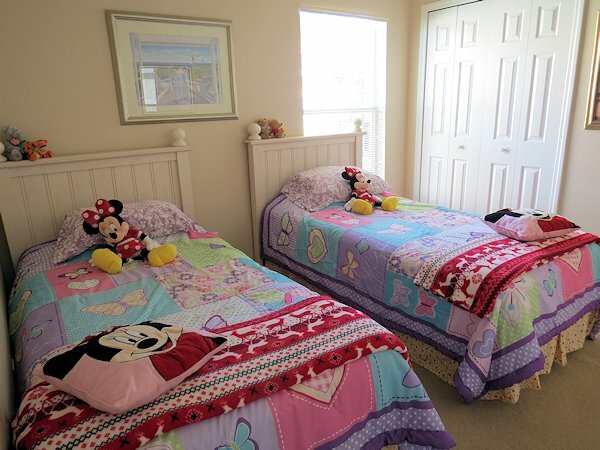 There are 3 bathrooms one each for the king and queen bedrooms and one shared by the twin bedrooms. There are 2 living areas one for family time around the 42” HD TV with access to our Netflix library or cable TV, the lounge is ideal for those alone times with a book or playing on your favourite device. 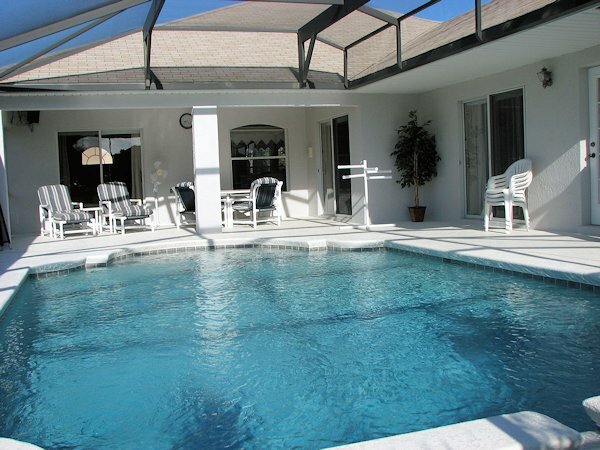 The large south-facing pool and spa is the highlight of our home for most of our guests so to ensure you can spend many hours outside we have chosen very comfortable outdoors furniture with a dining area all under a covered Lanai. The pool area also has a deck area large enough for your whole party to sunbathe. - We are not one of the ”one key fits all” villas - we have a keyless locking system and do not have numerous people walking around with a master key to our home. - All employee access codes are disabled once you are in residence - no chance of anyone gaining access without our knowledge. - Choose your own unique alarm code. 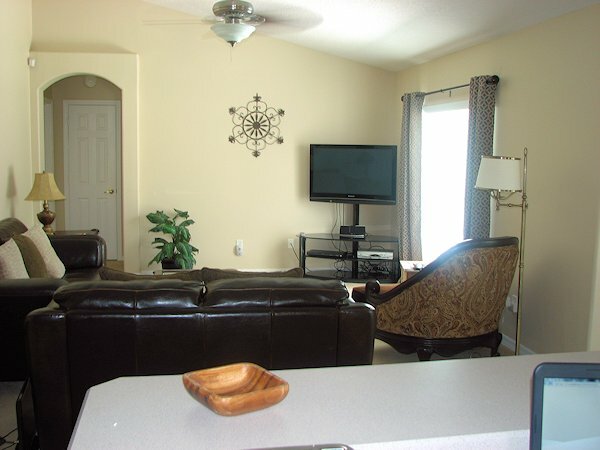 Communication and technology is a major part of todays world and our Orlando vacation rental home is equipped with free wi-fi, local, national and international phone calls and a monitored security system which is linked to us & our manager. You can keep in touch with other members of your party with our in-house intercom system. 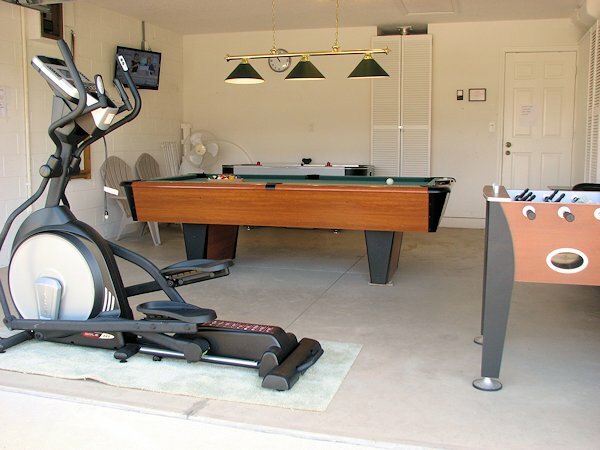 As well as the games room we also have an iPod dock with speakers & 42” HD TV in the Florida room. You will find a wide choice of books for you to read or if you want do a swap with one you have already finished. 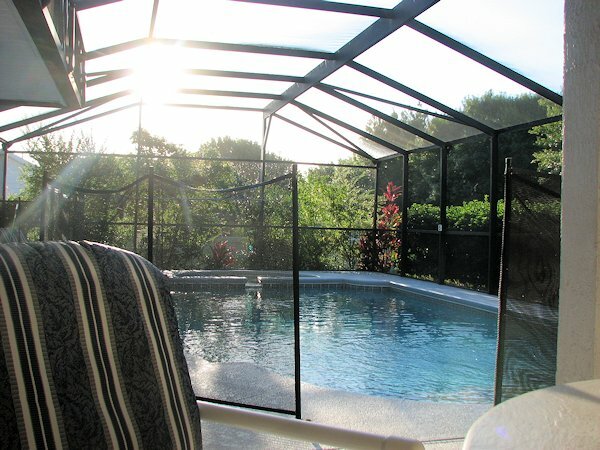 There really is something for everyone at our Florida holiday villa and everyone should be happy. Please enquire for more details on booking this villa, including pool heating prices. The new Golden Eagle Village parade of shops with a Publix supermarket is just under a mile south on US27. Travel a further 2 miles south for more local shops, a post-office, small supermarket and pizzeria. The nearest WalMart Supercenter is located a further 1 mile south on US27 before the intersection with US192. Adjacent to WalMart, there is a Blimpie Subs & Salad, Quiznos sub, Wendys, Taco Bell and a Chinese take-away. Should you need it, there is also a Lowe's electrical superstore on the other side of the road. For evening meals, a vast number of restaurants can be found on the US192 (east, towards Kissimmee). However, if you prefer to stay closer to home, there is Randy's restaurant and Devenney's Irish pub around 3 miles south of the community. Dream Stay Villa benefits from two living areas - one is ideal for quietly relaxing with a book or catching up with emails etc and the other is more for entertainment with a large flat screen cable TV with DVD player and ipod/iphone dock. We have three dining areas - one informal breakfast nook, a formal dining area and a al-fresco dining area - there is something to suit everyone and every taste or situation. Dream Stay Villa is a larger than average 4 bed 3 bath home - we have a Kingsize bedroom with en-suite bathroom and access onto the pool deck, a Queen bedroom with an adjoining bathroom and access onto the pool deck and two twin bedroom which has a Jack 'n' Jill bathroom. All the bedrooms have flat screen cable TVs. 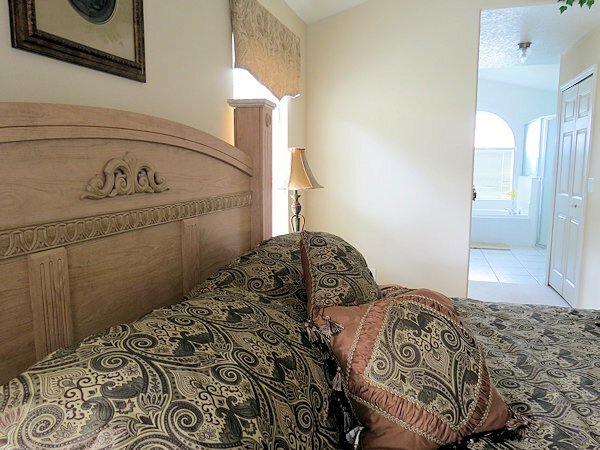 Whilst staying at our Orlando vacation rental home you will be sleeping on a king size bed (so big 2 of you will get lost – thank goodness for the intercom system) with private access to the pool area. You will have your own walk in closet, large en-suite bathroom with separate bath, walk in shower, his and hers vanity units and toilet room. Other members of your party will have use of a queen size bed with built in wardrobes and connected bathroom or 2 twin bedrooms which both have twin beds, built in wardrobes and share the third bathroom. Dream Stay Villa has a large south facing pool with inbuilt spa situated on a larger than average pool deck - the pool area is secluded and is surrounded by tropical plants and bushes, there is a charcoal BBQ free for use by our guests. 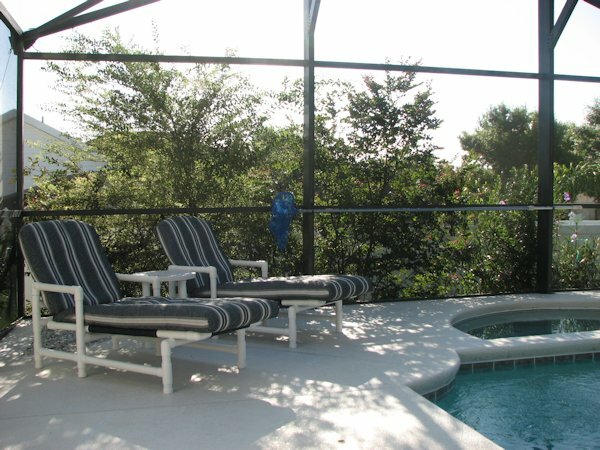 There is a large lanai for al-fresco dining and a TV point should you wish to relax outside, as well as plenty of room for catching a few rays. For our younger guests we provide free use of a travel cot, stroller, highchair, baby monitor, car seat and pool toys. For added security we also have pool door alarms which can be switched off by adults and a removable pool safety fence, a pool blanket helps keep the heat in the pool overnight and maintains the temperature so you can enjoy an early morning swim. There should be no problem when it comes to dining as we have so many local restaurants within a short drive which include Chilis, Santa Fe, Longhorns, Olive Garden, Starbucks, McDonalds, KFC, Outback, Bahama Breeze, Millers Alehouse, Taco Bells and many more (far too many to list them all - but there is something for everyone). 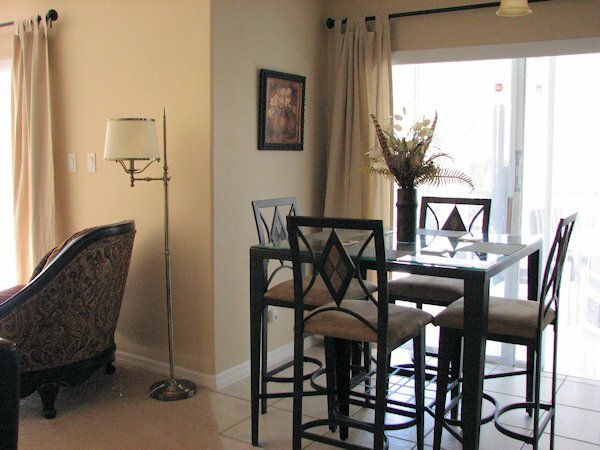 We like nothing more than grabbing a meal on the way home and enjoying it on the Lanai. If you would rather cook you can make use of our fully equipped kitchen and rustle up something yourself. 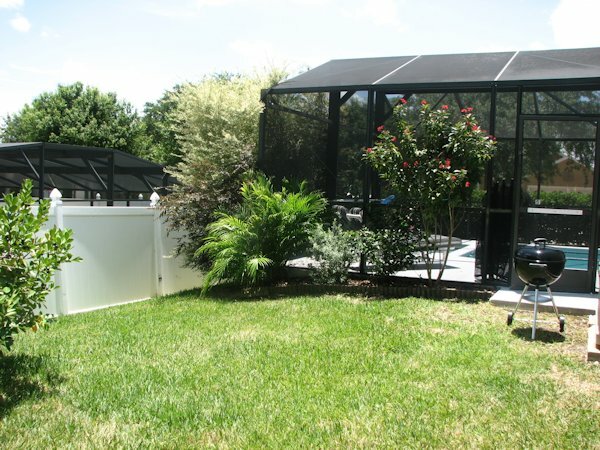 If you would rather you can make use of the BBQ (for which you can buy steaks, burgers or other delights at the local stores) all provided to ensure that you will be spoiled for choice at our Orlando vacation rental home.